The cards give various special abilities. Thus the players, step by step, create their life histories, trying to reach their goals. At the end of the game, players get points for different sets of cards. The player with the most points wins. 1. Life goal - show how a player can earn additional points at the end of the game. 2. Health - show sports and health activities which a player can do. They usually generate health symbols, but also help in dealing with bad luck. 3. Knowledge - show skills and education which can be gained. They usually generate knowledge symbols, but also help manipulate the dice results. 5. Work - 5. show where and how the player can be employed. They usually generate money symbols, but can cause various other good - or bad - effects. Work requires sacrifices. 6. Possession - to get possessions, it's usually necessary to have money. They give you satisfaction, that is, victory points! Cards with a cost: Some cards have a red slash on their effect. This means that the player has to pay the cost, as long as the card is active. The cost must be paid each turn, in the Add to CV phase. If the player cannot pay the cost (due to not having the appropriate symbols on the dice or tokens), then the card is lost and goes to the box. Dice tokens which were used earlier in the player's turn to buy cards cannot be reused for paying costs. Cards with 2 colors: Some cards have titles with 2 different colors and 2 card type icons. At the moment such a card is taken, the player decides which type of card it will be and places it in their corresponding stack. Lay the board on the table. Sort the cards according to their backs into 5 different decks and shuffle each deck. Place 6 decks - early adulthood, middle age, and old age - onto their respective locations on the board. Reveal the first 5 cards from the early adulthood deck and place them face up onto the track on the board. Deal one card from the life goal deck to each player, then reveal several more (the number of players minus one) and place them face up on the board. Check your childhood memories! For 4 players, deal 3 childhood cards to each player. For 2 or 3 players, first prepare the childhood cards as follows: Combine the bicycle card with 5 random cards (for 2 players) or with 8 random cards (for 3 players). Shuffle this prepared childhood deck and deal 3 cards to each player. Set aside the unused cards. Play your childhood! From the 3 received cards, each player chooses 1, then passes the other 2 to the player on the left. From the 2 received cards, each player chooses 1, then passes the last card to the player on the left. Each player now has 3 childhood cards and a life goal card to start the game. The player with the bicycle puts it face up in front of them and starts the game. This player also receives the bicycle token (to remember who started, in case the player loses their bicycle card during play). The game is played in rounds. In each round, players in turn play all phases of the round. The player who rode a bike as a child (has the bicycle card) starts each round. Play continues in clockwise order. to a maximum of 7). Then the player can reroll any number of the dice, two times. But dice with the bad luck symbol are frozen - they cannot be rerolled. Then the player can take 1 or 2 cards from the track on the board. The player must pay their cost, i.e., have the appropriate dice symbols as indicated by the costs on the cards. The player can set their dice and tokens next to cards being considered to help make the decision easier. The player can also play event cards from their hand and use the cards' symbols to help buy cards from the track. Unused symbols from event cards are lost. The player does not receive tokens for symbols on event cards, and event cards are discarded after use. If a player has 3 good luck symbols (from their dice and tokens), then these can be used to buy any card from the track, without paying the normal cost! If a card's cost also includes some special condition, the player must still fulfill it. 3 good luck symbols only covers the cost expressed in symbols. The player may slide a card a little bit from the track to help remember which card they are considering buying. The player rolls 5 dice (a 5th die was gained by the active relationship card Marriage). The symbols rolled are relationship, money, money health and bad luck. The player wants to buy the possession card Used car. The player needs 1 more money symbol. The player leaves the 2 money symbols and the "frozen" bad luck symbol on the table, and rerolls the other 2 dice. The rerolled pair give a relationship symbol and a bad luck symbol. The player risks rerolling the die showing a relationship symbol. 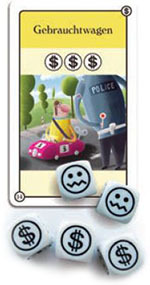 If the result is a 3rd bad luck symbol, the player will have misfortune and lose one active card. Luckily this second reroll gives a money symbol. So the player can buy the Used car and add it to their CV. 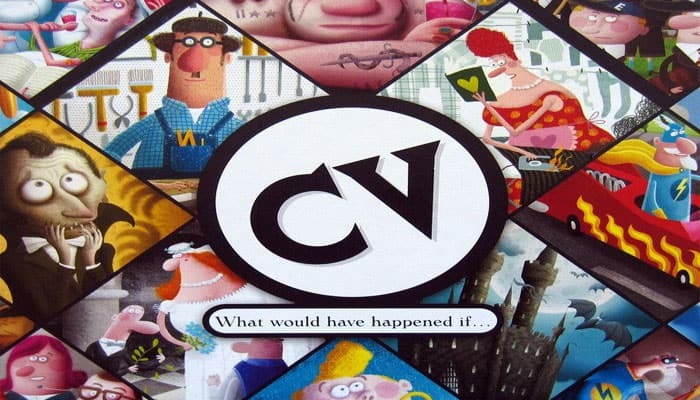 The player takes the cards bought from the track and adds the non-event cards to their CV. Cards in the CV should be placed such that all cards of a given type are in the same pile. Cards of the same type are stacked so that only the titles of earlier cards are visible. The card on top of a stack is "active". Active cards give the effect written on them. Each type's stack can have only 1 active card at a time during the game. For cards of type Health, Relationship, and Knowledge, the player has a choice. The card can go onto the top of the stack, or under any card in the stack. For cards of type Possession and Work, the new card must always go on top of the stack. Purchased event cards remain in a player's hand, like Childhood cards. The player moves all cards on the track to the left to fill any empty spaces, and then deals new cards from the appropriate deck to fill any empty spaces on the right end of the track. At the beginning of the game, cards come from the young adulthood deck. When it runs out, the middle age deck is used, and then finally the old age deck. At the end of a round (after the turn of the player sitting to the right of the player with the bicycle), the leftmost card is discarded from the track before adding new cards. Note! In the 2-player game this should be done after each player's turn, not just at the end of a round! Then the player updates their tokens. The player should have tokens with exactly the symbols shown on the effect area of their CV's active cards. (Tokens do not accumulate like income, but are simply a convenient way to represent the current symbols on a player's active cards)..
After the player updates their tokens, their turn is over, and play proceeds to the next player on the left. Each time 1 of the 3 decks runs out, momentarily interrupt the game to check if any players are eligible for social assistance. A player is eligible if some other player has at least twice as many CV cards than the player needing social assistance. Players who qualify for social assistance can immediately take any card from the track without paying the cost to add it to their CV. (However, any special conditions on the card must still be met to take it). Players using social assistance take their cards in clockwise order, starting with the player who is just finishing their turn. Example: After Julius's turn, the track is being refilled back to 5 cards. The last card from the young adulthood card is added to the track. The game is immediately interrupted, and players check whether anyone should get social assistance. Julius has 5 cards, Felix has 6, and Eric has only 3. Therefore Eric receives social assistance. Eric takes 1 card from the track, and then the game continues: the track is refilled with cards from the middle age deck. To the left of Julius is Felix, who now starts his turn. 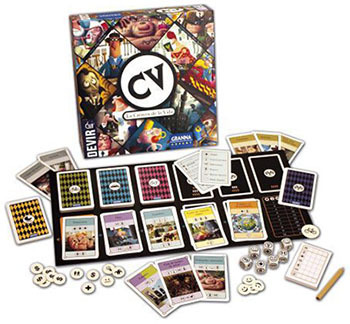 If it's the end of a round, and (after refilling the track) the old age deck has fewer cards remaining than the number of players, then the game is over, and players add up points.Players earn points from their CVs. The note pad can be helpful for adding results. First, count the points from the number of relationship, health and knowledge cards owned. 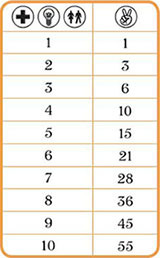 Points for these cards are gained according to the table. Then count the points from possession cards by adding the points printed on each possession card. Then players reveal their personal life goal cards and check how many points are gained from them. Players also check who gains points from the public life goals which were visible on the board from the start of the game. Each of the public goals awards additional points to whoever best achieved it. If several players tied in achieving a goal, they both get full points for it. The player with the most points wins. In case of a tie, the player with fewer CV cards wins. If there is still a tie, then it remains a tie! Example of scoring: The game has ended. Players add up their points. Felix gains 10 points for health cards, 6 points for relationship cards, and 15 points for knowledge cards. His earns a total of 19 points from his 5 possession cards. His secret goal was A healthy mind in a healthy body, and he gets 8 points for fulfilling this goal. Of the 2 public life goals, Felix fulfilled the Collector goal, as did Julius who also has 5 possessions, while Eric has only 3. Both Felix and Julius gain 5 points from the Collector goal. Thus Felix's total is 10 + 6 + 15 + 19 + 8 + 5 = 63 points.